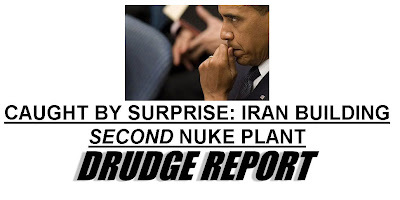 Drudge is awesome. He's awesome because I am talking about him. He's awesome because he can pretty much headline what he wants and it becomes a talking point. He's brilliant. But he's also a douchebag. "White House officials said Western intelligence agencies have been tracking the facility for years. Obama said officials from the United States, France and Britain briefed the IAEA in Vienna on Thursday on what they knew about the facility. The three heads of state decided to publicly disclose the existence of the facility after learning that Iran had become aware the site was no longer a secret." Tracking it for years and somehow it was a surprise? What people will be talking about is how that Bush Obama was surprised by its finding. Drudge is brilliant. I'll give him that much. I understand your point, but if that's true then I am surrounded by brilliant people where I work. They love to come to awesome self-promoting conclusions that are not in anyway related to the evidence.